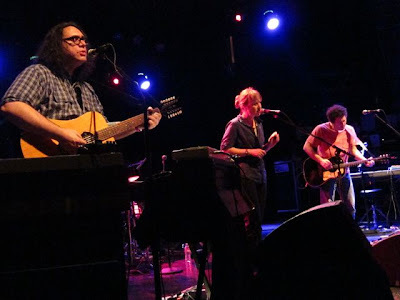 Yo La Tengo played the penultimate show of their "wheel tour" last night at the El Rey Theater in Los Angeles. 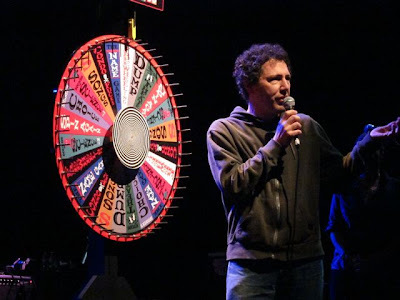 The wheel landed on SitCom Theater, so the band, crew and special guest star Laura Kraft performed an episode of Sponge Bob Square Pants. Everyone was hoping for a set of Condo F*cks songs so they performed a few before taking a short break and launching into another tremendous show. Look at that beautiful wheel!!! I have a picture of Ira from 1999 or 2000, doing the monologues at ASSSSCAT, in which he strikes precisely that same pose. People do things!